Life safety for both your adult AND children residents is your responsibility, and children come with their own unique set of risks. 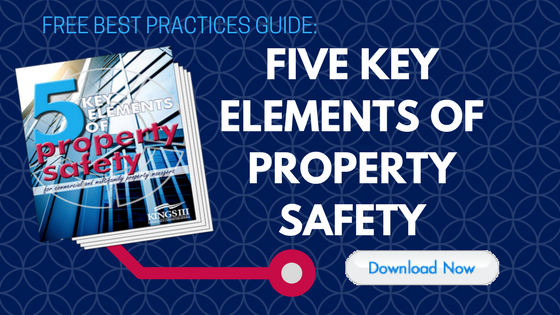 Here are some safety measures that you can take on your multifamily property specifically with children in mind. Most landlords and property managers know that it’s unlawful to refuse to rent to residents just because they have children. That said, residential property should absolutely allow for a safe, friendly environment for kids, where they can play without facing physical or environmental danger. Entire communities benefit when residents feel secure and life safety needs are addressed. As the property owner, it is your job to take action to deter crime and protect children from accidental injury. There is no doubt that residents with children prioritize their children’s safety above all else, so you should too. After all, with social media, if something goes wrong on your property- ESPECIALLY involving a child, word can get around fast. Confirm the workability and usability of all window and door locks. Make sure that they’re childproof, so that a child could not easily open them. Make sure all railings and balconies have secure hand railings. Railings wear out with time and use. Check your local safety laws and regulations for guidelines. Be sensitive to how pesticides and traps are used. You should be aware of any environmental or physical danger threats they may pose. Check with your landscaper and/or exterminator. Air out a room that is freshly painted. Fumes can cause damage, especially to little lungs. Make sure rooms are freshly ventilated before you allow residents to move in. Whenever possible, add this extra layer of security that only residents can open. Make sure your front door pathways are free of debris and are well lit. Be aware that some kids enter and leave the premises without their parents, who may be at work or away from the home. Doorways should always be clear of any obstructions, to protect residents of all ages from accidents and falls. Keep your stairwells and hallways clear. Kids tend to leave their toys and bikes behind. Regularly monitor your spaces so that they remain clear and uncluttered. How safe are your stairs? Find out by reading this blog post. Find out if their children have any special needs, or how you and your staff can be more accommodating to them. Do your best to make sure that your resident families’ neighbors are trustworthy and free of past criminal activity. Perform background checks and screenings of your property management staff. It is not unusual for thieves and predators to inconspicuously work within property staff. A policy like this can discourage felons, who won’t be able to successfully apply. Make sure your team knows life safety protocols and receives training. This could include CPR, water safety certification, basic first aid, fire and natural gas detection and self-defense techniques. Know your smoke alarm and carbon monoxide detectors. These devices are required just about everywhere, but you can take it a step further by checking them in hallways and dwellings more than just regularly. Know your local laws on this matter and train your staff. Educate your residents on the use and testing of the devices. Exceed the minimum requirements to lessen the chance of disaster. Provide access to emergency response at your pool. Most residential properties with a pool do not have a lifeguard on duty and even so, lifeguards do not work around the clock. Keep an emergency pool phone (required in some states) onsite in case of an oversight and for off hours. Fences, locks and other child barriers should surround the pool. Include life-saving equipment (life rings, reaching poles) in the area, and make them easy to grab. Train your staff in water safety. 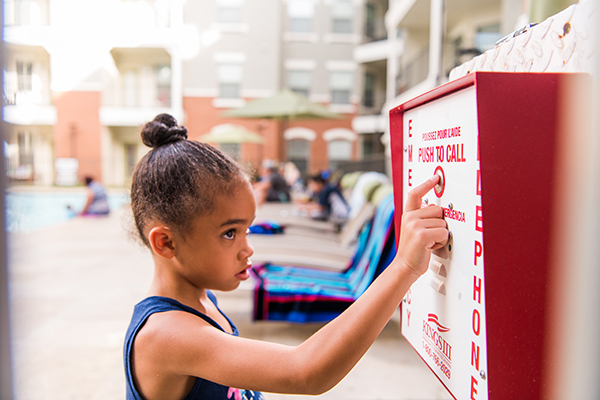 Note: Our emergency pool phones have been used for all kinds of emergency situations, not only pool-related. See some examples of the calls that we have received year-round from an emergency pool phone. Perception goes a long way toward a feeling of safety and as a deterrent to criminals. Keep your property free of debris and litter. Show that you care about your property and have zero tolerance for trouble or dangers to kids. Install surveillance cameras and emergency communication. These are the best deterrents to criminal activity and lifesaving in case of accident and injury. By following these steps, your property will be more appealing to families, perceived as safer and kid-friendly. To learn more about how Kings III can further help you protect children and increase the life safety and value of your facility, visit www.kingsiii.com.